Who knew a piece of square fabric could cause quite a stir among kids? Normally, I'm the one who asks my son, Noah, how his day went and there are days when I have to try harder in probing for the highlights of his second-grade life. But this time, it was different. All the eagerness came from him and I couldn't wait to hear what the excitement was all about. "Mama, so...you know how we play outside for recess, right? It was so hot today and I really got so sweaty!" Then I just responded with my usual, "Uh-huh...", waiting for him to give me the clincher. "Well, when we went back to our classroom and we were all seated, I pulled out my hankie and then one of the boys said, 'What's that?!' So then I said it's a handkerchief. And then right after that, someone else shouted, 'What ds'it do??!!'" What was so striking was how my son tried to copy, as best he could, the sense of awe in his classmates' voices. It was as if they had just seen something completely magical and alien! Naturally, I had to ask, "So, what did you say?" Then my son said with a matter-of-fact tone, "I told them 'I use it for wiping my sweat, or in case I get a nose bleed, etcetera'. But it was weird 'cos when I looked around, I saw that there were about 10 kids looking at me and my handkerchief!" Since this conversation with my son happened with caffeine already in my system, and way before my brain connections got shut down by too much stress, I had enough sense in me to ask him the most important question: "And how did that make you feel?" He said, "Nothing. 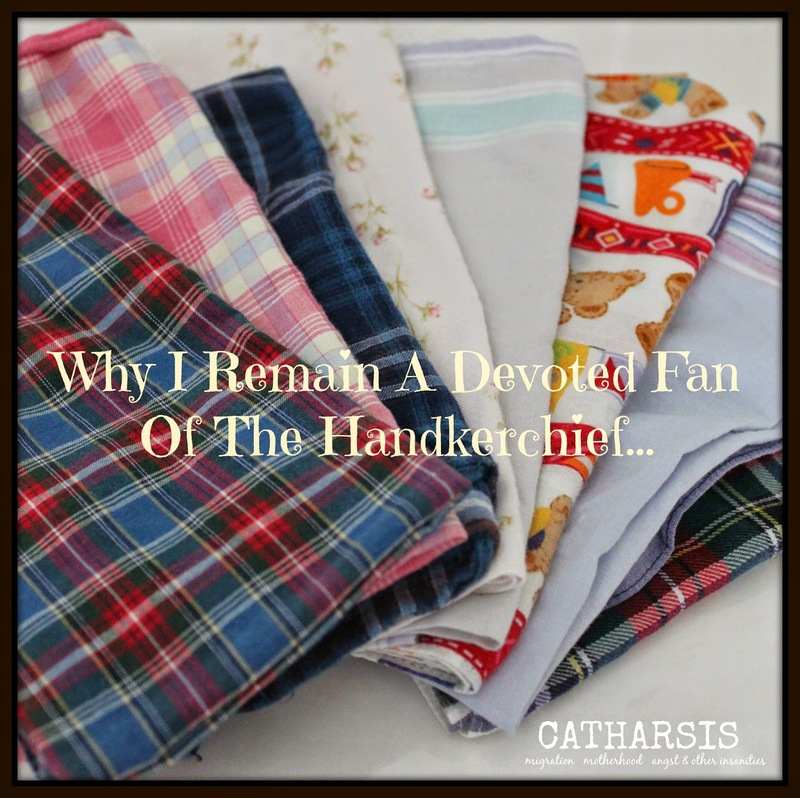 I just thought it was weird that they were all looking at me and that they didn't know what a hankie was." I was relieved and proud after hearing my 7-year old say that. I knew he felt 'different', and maybe even a bit scrutinized like a strange specimen. But from the way he retold this story to both me and my husband, we can tell that there was a part of him that either didn't really care, or was even maybe proud of this sense of difference. He didn't feel shy or ashamed about how he stood out. I'd even go so far as to say that he felt special for seeming like the only one who knew what a handkerchief was and has one in his pocket every day of the week. To him it was nothing to fuss about. Ever since he started kindergarten, I've always had him carry a fresh hankie in his pocket every single school day. I am doing this, just as my mother did the same to me and my siblings growing up. And frankly, it's very likely that every single Filipino (who grew up in the Philippines) has this same habit as well. My son knows this; knows that his familiarity with the humble handkerchief has a lot to do with his ethnicity. The hankie is a very practical thing to carry, in my opinion. And in the Philippines, with warm and humid weather prevalent almost all year through, it just makes sense to carry this so you have something to easily and quickly pull out when you need to wipe beads of sweat off of your face. It also comes in handy when you need to cover your nose so you don't end up breathing in all the urban pollution that assaults you when you're taking public transportation. (I would never use it though for blowing gunk out of your nose. I think that's just too gross). It's an accessory that is very common among Filipinos that when you go to the department stores, or any store selling clothes and accessories, you are bound to find these square cotton fabrics in a variety of designs --- plain colored, checkered, striped, floral, and every other cute design you could think of. And the material, in my opinion, is far more absorbent than the ones I find here in the States. This is why whenever we have family members who visit us here, I always make sure to ask them to buy some for us. It's probably even cheaper too!... (as long as you don't factor in the airfare). My husband and I both found this incident amusing, but more importantly, took it as an opportunity to explain to our son the cultural reason behind his friends' lack of knowledge regarding the hankie. It's not a matter of smarts, but rather simply a matter of familiarity and preference. We explained to Noah that handkerchief use is probably not as popular here in the U.S. than it is in the Philippines because of the cooler climate which means you rarely sweat profusely. We explained that he uses it because it was also how I was socialized as a child and it was part of my daily routine dressing up for school. We explained that some people view it as old-fashioned or unhygienic, and don't see the need for it, given that they could just use disposable options such as paper towels, tissues, or wet wipes. My husband also pointed out that a lot of the times, other kids just use their shirts to wipe off their sweat. I'm sure when he said this, he also found an excuse to interject that 'Mama is too much of a neat freak to let you just use your shirt to wipe off your sweat'. After all is said and done, I have to admit that I now have a deeper level of appreciation for the humble hankie. I really think that it has not only strengthened my son's confidence, with him not backing down in the face of scrutiny and feeling different; it has also given him a greater sense of pride about our ethnicity and the kind of socialization experience our cultural background opens up for him. He knows differently (maybe more) than his peers not just because Mommy's a neat freak. But because Mommy insists on still practicing some of her old Filipino ways. And there really shouldn't be any shame in that. I know some people don't like hankies because they think they're not hygienic, or are too old-fashioned. Others love it because it's a 'greener' approach. What are your thoughts? And, are there practices rooted in your childhood (or your ethnicity) that you now find yourself passing on to your children, that somehow makes you unique and gives your child-rearing practices your 'personal stamp'? I would love to hear your point of view! Oh my god, I need a hankie!